Contrast, in one form or another, is always a part of successful, dynamic picture making. our minds can also see them as part of a circular continuum - as we seek wholeness. This is quite a fascinating phenomenon which serves to enrich our pictures! Did I miss anything? Lots of contrasting elements in this capture! I'm linking into Exploring with a Camera - Visual Contrast. Read more about contrasts from Kat (here) and at her link to Micheal Freeman. wow, so much to look at in this photo. great job with the contrast theme. Yep, you got it, and it is a fabulous photo! 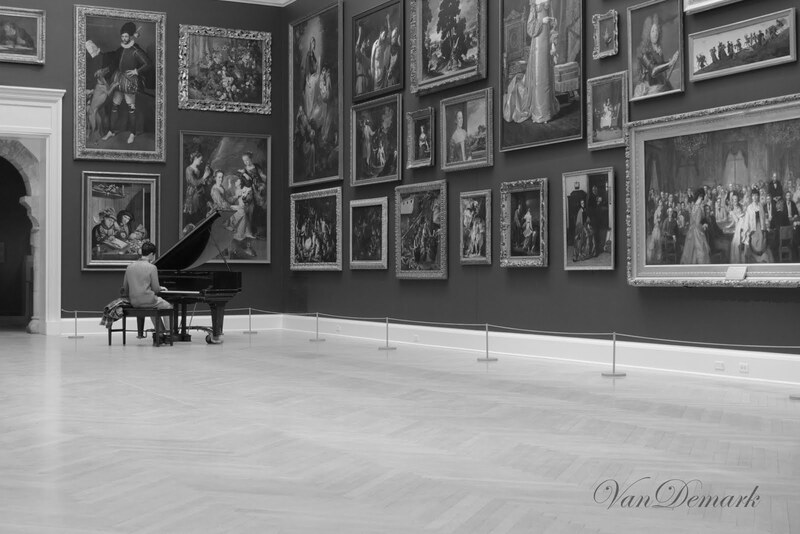 The contrast I love most of all - is how small he and the piano appear to be juxtaposed against that grand wall of art. Nice image! What a beautiful setting! I love what you wrote and the contrasts you found. I also noticed the contrast of the different art forms - music in an art museum setting. So wonderful. Thanks so much for linking in to Exploring with a Camera. I love what you bring to these explorations! so happy i did not miss this artistic capture ~~ love it!! Great subject for b&w. Lots of contrast. Wow! So many contrasts here....I love the angle of your shot and the composition! Truly beautiful, the perspective is just fabulous!